This repository contains preliminary work results for identifying linguistic features for novelty detection in news articles and tweets. We report here results of a crowdsourcing experimental pipeline of assessing the relevance of various tweets and news article snippets and the sentiments and intensities they indicate. 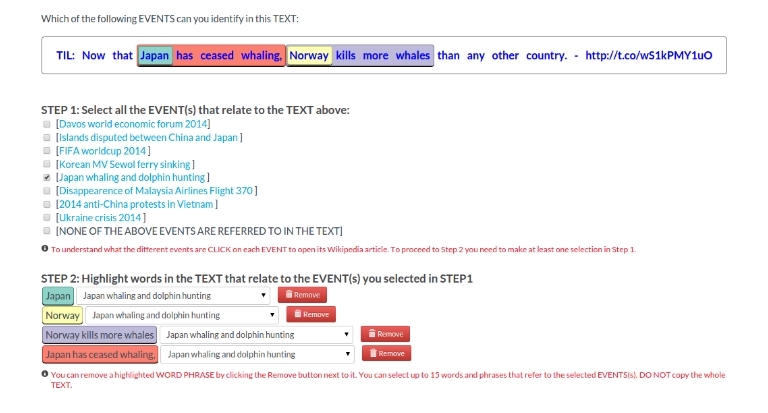 The main focus of this dataset if to gather initial relevant and novel information insights, with regard to the event of "whaling". All the crowdsourcing experiments were performed through the CrowdTruth platform, while the results were processed and analyzed using the CrowdTruth methodology and metrics. For more information, check the CrowdTruth website. For gathering the annotated data, we used the CrowdFlower marketplace. The file contains the relevant news snippets ordered by their relevance score. The overlapping news snippets are ordered in a descending way, while the non-overlapping news snippets are ordered ascending. The file contains measures for snippets relevance with regard to their position in the news articles. The file contains the relevant news snippets ordered by their sentiments: positive sentiment - descending, negative sentiment - ascending. The file contains the relevant tweets ordered by their relevance score. The file contains the relevant tweets ordered by their total number of relevance event mentions. The file contains the number of relevant tweets for each relevance score intervals. The file contains the relevant tweets ordered by their sentiments: positive sentiment - descending, negative sentiment - ascending. The file contains relevant event mentions in tweets that refer to "whaling ban". Each such relevant event mention has the associated sentiment and intensity acores. The raw data collected from crowdsourcing for each of the 2 tasks. 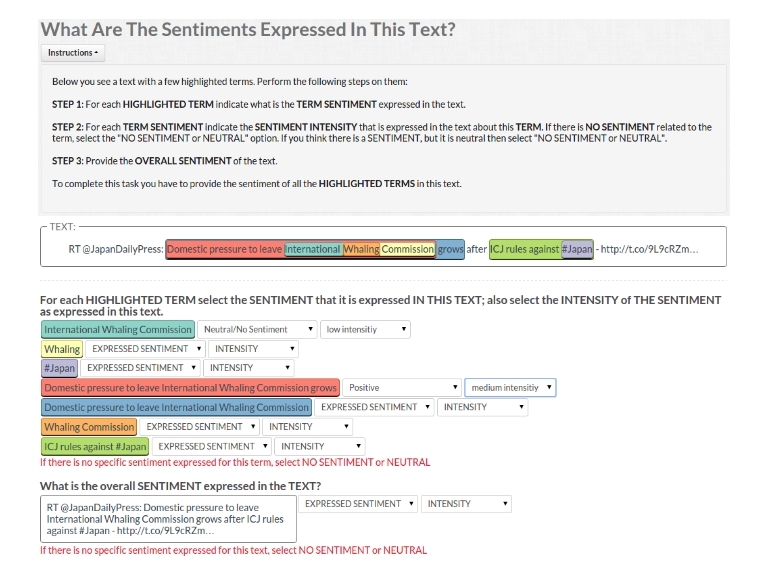 Sentiment Analysis: to identify (1) the sentiment of each relevant event mention in all the relevant news snippets and tweets and (2) the overall sentiment of all the relevant news snippets and tweets. 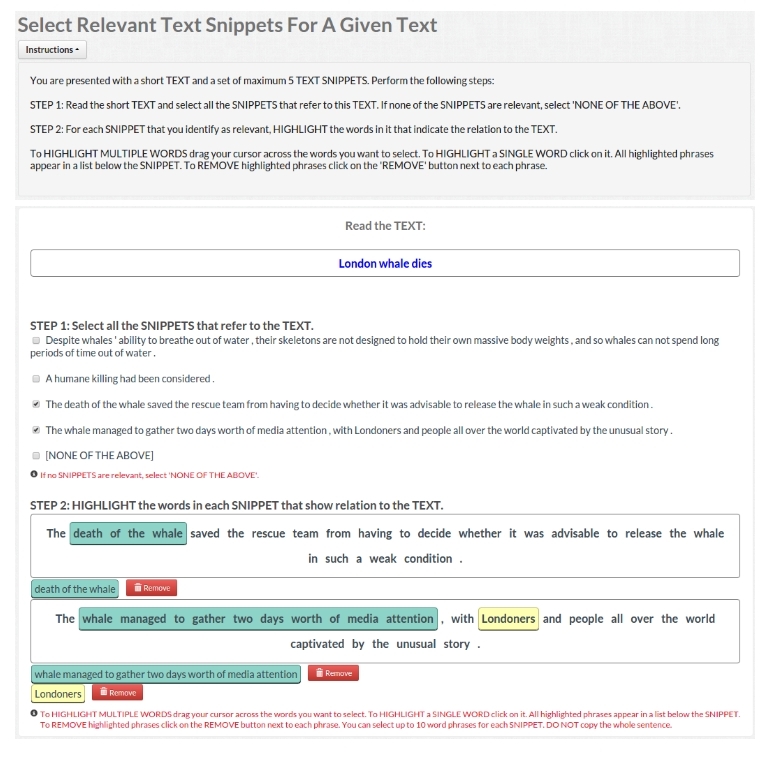 During the "Relevance Analysis" task, for the news articles dataset, the crowd is first asked to select all the relevant snippets with regard to the article title, where the title is considered as an expression of the event and then highlight in them all the relevant event mentions. For the tweets dataset, the crowd is asked to assign relevant events (from a list of predefined events) for each tweet and also highlight all the relevant event mentions in it. This results in a set of relevant snippets and tweets and a set of relevant event mentions in those. Using CrowdTruth cosine similarity metric we compute relevance scores for each snippet, tweet and event mention of the "whaling event". 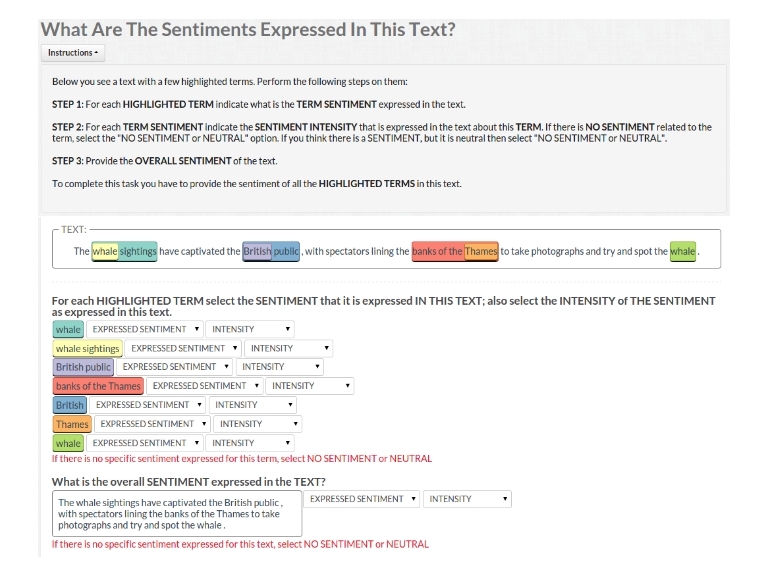 During "Sentiment Analysis" we gather from the crowd the sentiment (in terms of positive, neutral or negative) and its intensity (high, medium, low) for (1) all event mentions identified in the "Relevance Analysis" task, and (2) the overall sentiment and its intensity of each snippet and tweet. 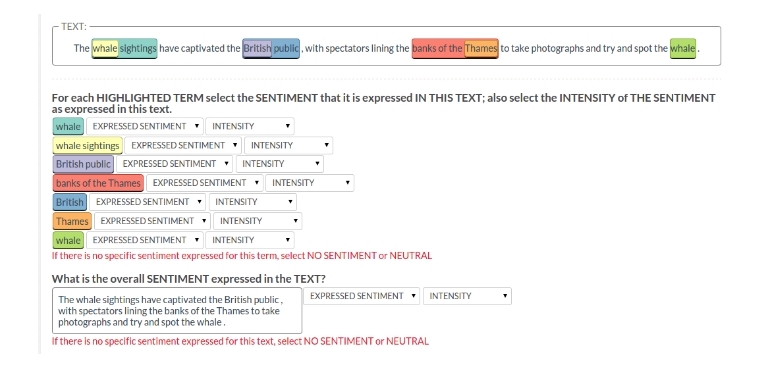 Here again, we use the CrowdTruth cosine similarity metric to compute sentiment and intensity scores for each event mention, tweet or snippet. 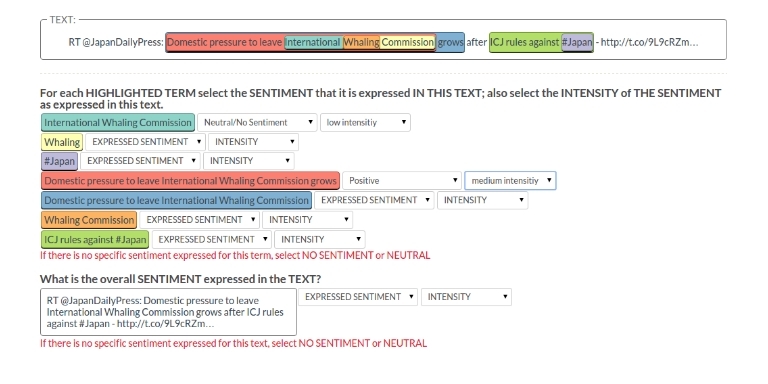 The relevant News Articles to the Whaling Event are used as input for the Sentiment Analysis Task. 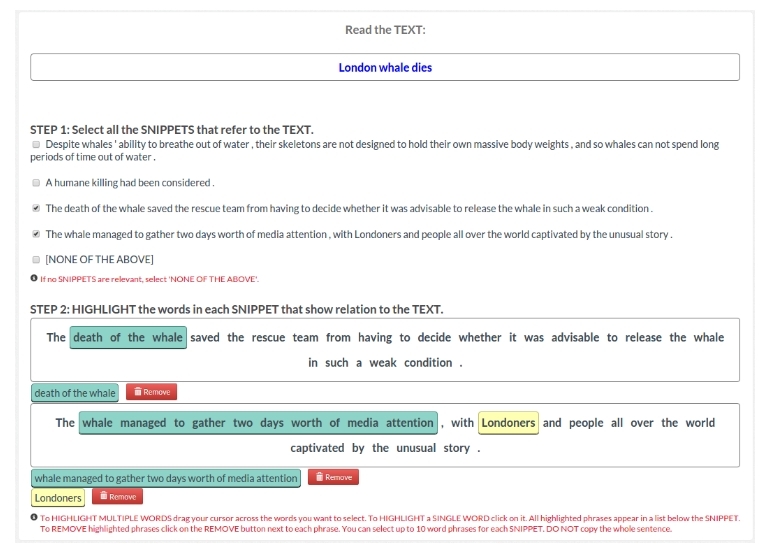 The following two plots show the distribution of the relevance scores of the text snippets (overlapping with the title - blue, non-overlapping with the title - red) and the distribution of the number of relevant mentions identified by the crowd, across the relevant text snippets. 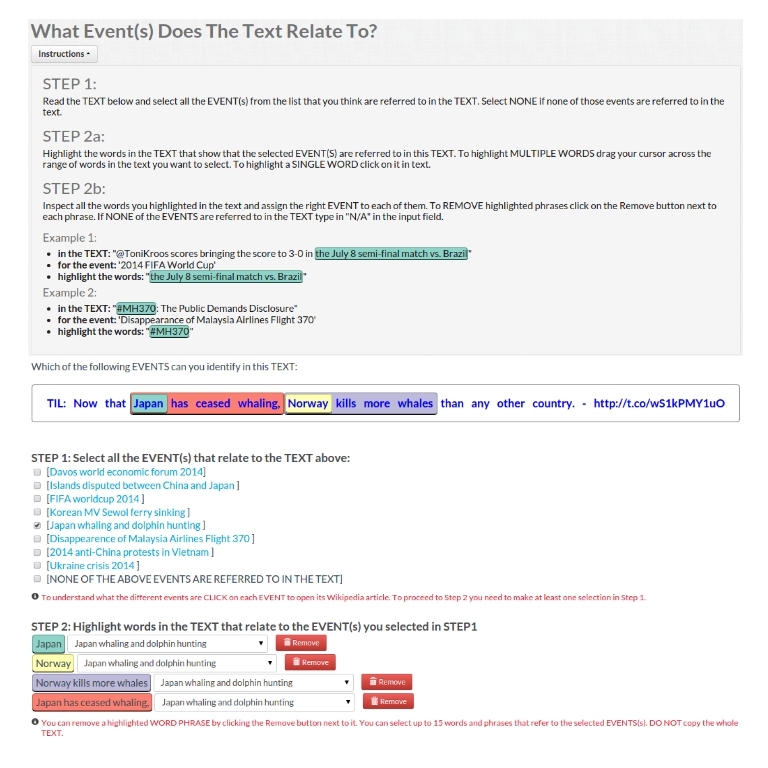 As we can observe, the distribution of relevant mentions in a text snippet follows the same trend as the relevance score of the text snippets: the more relevant the text snippet, the more relevant mentions found by the crowd. we take here as an example the article "25940", where the number represents the 'Title Id'. news snippets that are located at the end of the article. We merge the results of the two tweets datasets (from 2014 and 2015) and use their aggregation for the rest of the analysis. We extracted from the tweets datasets, DS2 and DS3, a subset of the tweets identified as relevant by the crowd and containing relevant event mentions "whaling ban". There is a strong positive sentiment about the decision to ban whaling in Japan. However, this drastically transforms into a negative sentiment immediately after facts such as Japan plans to continue whaling are published.